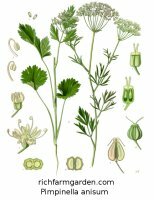 Anise - Pimpinella anisum - Perennial; Used in lending foods a licorice flavor and as a digestive aid. Fragrant blooms and leaves. Drought tolerant. Full sun or partial shade; height: 24in.